Your crystal set is made from solid and pure labradorite of Madagascar. They are shiny yet semi-rugged: one is puffy and rounded, the other is flat for easy carrying. These pieces have breathtaking rainbows that shimmer in the light. They are polished, yet have many natural lines and veins as Mother Earth has intended. One of a kind treasure, hand picked by Satin Crystals to you. Receive the exact one featured when you order from Satin Crystals. Polished stones are excellent for crystal layouts and grids. Place them directly on the chakras and/or around the body to infuse energy, or form grids around a space to keep feng shui. They also make wonderful worry stones- rub when you are feeling anxiety to release your stress and absorb the positive energy of your crystal. 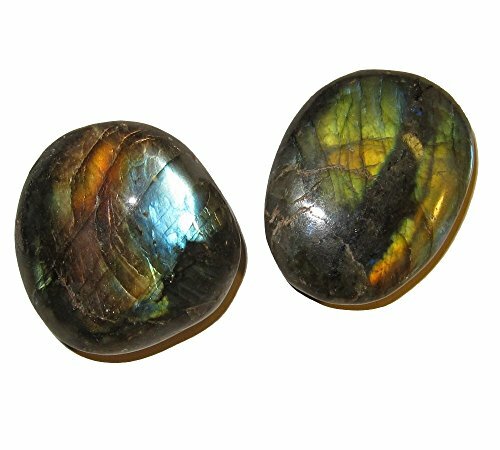 Labradorite deflects unwanted energies. It helps generate motivation and enhances the rainbows of your personality. An excellent tool for those practicing metaphysics and the supernatural. If you have any questions about this product by SatinCrystals, contact us by completing and submitting the form below. If you are looking for a specif part number, please include it with your message.